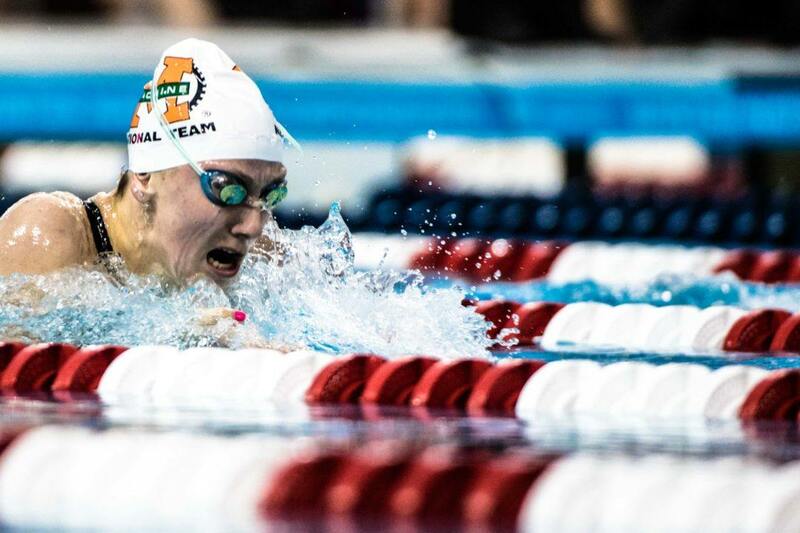 In the 100 breast finals on day 2 of the NCSA Spring Junior National Championships, 16-year-old swimmers Anthony Grimm (Mason Makos) and Anna Keating (Machine Aquatics) posted top-five times for the 15-16 age group. The first to swim was Anna Keating. She came in the meet already under one minute with a 59.65, the 8th-fastest time in the 15-16 age group. In prelims, Keating cruised to a 1:00.45. But in finals, Keating dropped nearly a second and a half to win with a 59.04, splitting the race 27.81/31.23. Keating’s time is now the 4th-fastest time in the 15-16 age group and less than a second away from Alex Walsh‘s 2017 NAG of 58.19. For all 18&U swimmers all-time, Keating now has the 11th-fastest 100 breast time. A little later in the meet, 16-year-old Anthony Grimm came in as the 18th-fastest 100 breaststroker in the 15-16 age group with a 54.10. In prelims, Grimm dropped down to a top seed of 53.42. In finals, Grimm had a shot of joining an elite few 15-16 swimmers who swam under 53 seconds in the event. With that fuel, Grimm split the race 24.51/28.00 to win the event in a 52.51, dropping a full second from prelims. Ranking Grimm with all 18&U swimmers, he has the 11th-fastest time ever in the event. The 16-year-old Virginia-native, however, has proven his backstroke a force to be reckoned with. At the 2019 Virginia Class 6A State Championships, Grimm led of the Oakton 200 medley relay with a blistering 20.87 backstroke split. At the same meet, Grimm put up the 6th-fastest 50 free in his age group with a 19.67. Despite not swimming the 100 back at the state meet, 2 weeks earlier Grimm swam a 46.63, ranking him #4 for the 100 back. With his 100 breast performance at NCSAs, Grimm now holds three top-10 times in the 50 free, 100 back, and 100 breast. He got DQed yesterday in the 100 IM but apparently went a 47.7 or so. Shane Blinkman won the event at 48.7. Not sure what the DQ was for. Whatever college he chooses is going to have a ton of options with him, though. Incredible swimmer. He was 47.80, he DQed for going past 15 on the backstroke underwaters. Yeah I’ve heard he’s looking at Texas as well. He goes to the same high school as Shebat went to as well, for another connection. Would be pretty cool to step in after Shebat is gone and take things to the next level in Austin. He’s definitely got the speed for it. Grimm’s versatility across the sprints is insane. He’s a sophomore. He’s gotta be the top recruit in his class. But he really does NOT swim the 200 distance. His top 2IM this winter is 1:56. Top 200 back this winter is 2:00 (yes yards)… obviously that was not done at a big meet. But suffice to say his focus is 100-down. Grimm quickly becoming the #1 recruit in the sophomore class, I imagine we will see a 45 100 back this week. 100 breast is arguably Grimm’s third-best event (4th if you include the 50 back), and he put up a time that would have made this year’s NCAAs. And he’s a high school SOPHOMORE. Absolutely incredible. Can’t wait to see him long course. I watched his 50 back swim back again and you’re definitely right. However, I think knowing that is such a strength will hopefully motivate him and his coaches to work more on how to improve in the long pool and develop more skills that will benefit him for that course. At a 20.8 50 back he’d be a shoo-in for a 50 back finals appearance at Nationals if Nationals was held in yards, with a decent shot at winning. The tough thing will be translating that to LC.